Antalya – Turkey is a huge city, which is located on the Mediterranean coast, and every year is visited by millions of tourists from around the world. This city is famous not only beautiful beaches and high-class hotels, but also historical monuments and attractions. We travel offers bars, restaurants, cafes, a large number of night clubs, discos, boutiques, shops, several water parks. Many tourists get acquainted with the city briefly, during a trip from the airport to the hotel and back to the shuttle. 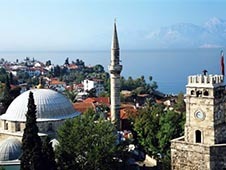 But Antalya is to slowly wander through its streets, experience the atmosphere of the ancient city center. The best travel option in Antalya – a trip by car, offering to rent the Internet company bookingcar.ru. It is possible to book a car in advance or take her rented immediately after arrival, at the airport. Before you press on the gas pedal, you need to learn some of the mandatory rules of the road that are in Antalya. Antalya right-hand movement with the permitted overtaking on the left. To carry a child in the car may be in the rear passenger seat. Children who do not have 12 years and their growth does not exceed 150 cm, it is forbidden to ride in the front seat. Use of seat belts is obligatory both for the driver and all passengers, who are in the car. It is forbidden to talk on a cell phone, if there is no headset, allowing both hands free. Be sure to provide the advantage of ambulances, fire services, security, police. Inside should be a first aid kit, and in the trunk - emergency signs. The fire extinguisher is not required. Outside the city - 90 km / h.
Allowed to park wherever there is space, but there is no prohibiting sign. Parking can be both free and paid. In the city-appointed parking price is much lower than in private. At night it is recommended to leave the car in the parking lot are guarded. The dose of alcohol should not exceed 0.5 ppm. Otherwise, the driver will be fined, and if history will repeat itself - the penalty will increase significantly. Better not to drink and drive, to avoid accidents and trouble with the police. The main feature of vehicular traffic on the Antalya - a failure to comply with traffic rules by local drivers. Turks love to drive fast, but it does not signal the upcoming turn or stop. At night, many "forget" to turn on lights, but may suddenly stop in the middle of the roadway. Often goes to the dividing line, and continues her motion. If you park your car, rent somewhere near the apartment building, there is a good chance that you will take the place of resident of Antalya, which is at best zateet hearing about your intrusion and at worst might break something. It is much safer to use the municipal parking lot. Be careful, be careful on the roads of Antalya, and then nothing will spoil your vacation!